Congratulations, I was very impressed with your site. You have won the Gold, the most prestigious Sterling Award. Your site is indeed the "best of the best" and we are humbled and truly honored that you have chosen to apply for our award. You make us say, "We wish we could do that." Approximately 2% of all sites will receive this award. Congratulations you have won the prestigious "This Site Bytes Award"! Thank you for giving us the opportunity to review your site. We found it to fit our criteria and are pleased to be able to put you on the winners page and share your site with the world!! A great helpware site, featuring good design, useful help, and a good measure of humor. 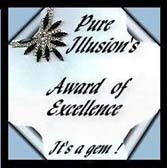 Congratulations from Pure Illusion Awards. We are honored to inform you that you have won the "AWARD OF EXCELLENCE." None of our awards are easy to win and you should feel honored to have received this recognition of your hard work. Currently only 17% of the people that apply for our awards win. Only 4% of the people applying win an Excellence award. You have done a fine job. Your hard work and pride show and it is an honor for me to present you and your website with this award. Your site has won the Designers Arrow Award for superior web site design and content. You have an interesting and useful web site with easily defined navigation. I enjoyed my stay at your site. I ended up doing more than judging your site  I mixed browsing in as well. I enjoyed the content very much. Your site is one of the best html guide sites I have seen and is greatly deserving of the accolades you have received. Alfred Norman - TGDesign Inc.
"I asked my Dad how I will know if I'm truly successful. He said, "Your wife will tell you."" "Why do we say something is out of whack? What's in whack?"